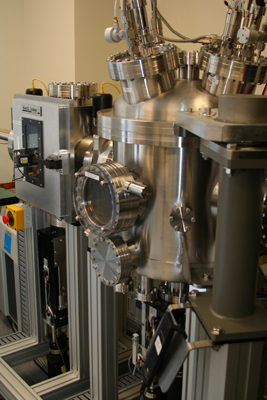 A load-locked, computer-controlled, planar magnetron sputter system with four sputter guns and RF etch back. Guns 1, 3, and 4 are always loaded with Au, Cr, and Al targets, respectively; Gun 2 is TiW by default, but may be switched to other materials upon request. Typical uniformity of <5% over a 150 mm wafer.